ShareASale is a third-party affiliate tracking program. When setting up your ShareASale account, you will be given a specific tracking code. To get your specific tracking code, you can go to: http://www.shareasale.com/m-gettrackingcode.cfm. where XXXXX is your ShareASale merchant ID. To integrate this code with AmeriCommerce, go to Settings > Orders > General in the Admin Console. Here you will see a section named Place Order Script. This is where any code that's supposed to go on your "thank you page" to track successful orders will be placed. 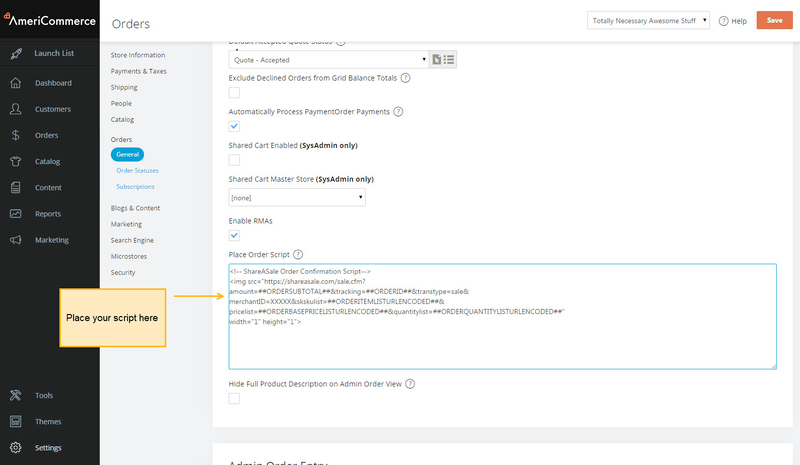 Copy and paste the code from ShareASale into the Place Order Script field. You will notice merge codes replacing the placeholders from ShareASale, such as AMOUNTOFSALE. You will need to do this for each placeholder field in the ShareASale script. This way AmeriCommerce can fill in the information from your orders automatically. Where XXXXX is your merchant id. This scenario covers most of the basic uses of the ShareASale affiliate tracking program. In this script, we are sending the item numbers as a comma separated field in the skulist parameter. The price lists as a comma separated field in the pricelist parameter. Finally, the quantity list as a comma separated field in the quantitylist parameter. This will tell ShareASale the purchased products on the order, as well as the prices and quantities of each. To use this type of script, you will need to upload a product list to ShareASale. Both of the above scripts covered the Per-Sale affiliate type in which affliates are rewarded for actual generated sales. Another approach is the Lead approach, in which affiliates can earn commission from generating leads. Note: In Lead based scripts, ShareASale still requires the amount parameter even though it is always set to 0 in this case. Also, "TYPEOFTRANSACTION" seems to be replaced by "sale" in the example, but it's not a merge code... should it be?